It's easy to think of Ello as the anti-Facebook. After all, it's reaping the benefits of a so-called "exodus" from the social media giant. 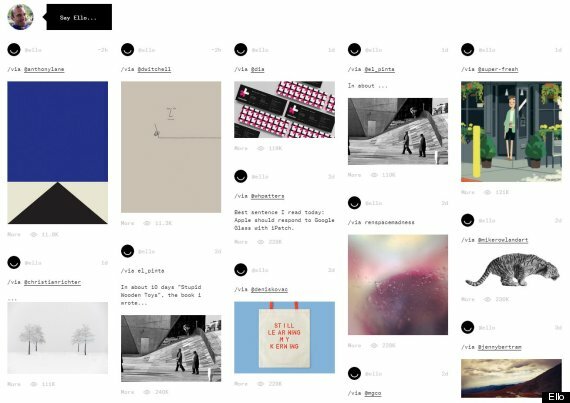 Ello is a social network launched in July by a group of seven artists and designers. One of its biggest selling points is the fact that it has no ads and doesn't sell users' data to third parties. "Virtually every other social network is run by advertisers," said an introductory post from July. "Behind the scenes they employ armies of ad salesmen and data miners to record every move you make. Data about you is then auctioned off to advertisers and data brokers. "You're the product that's being bought and sold." 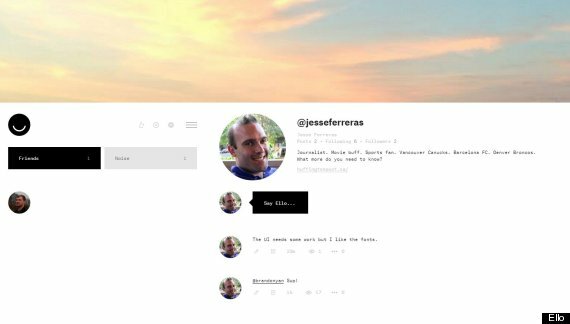 A personal profile on Ello. But also important to a number of recent recruits, Ello doesn't require them to use their real names. Recently, Facebook has faced criticism from a number of users who are unhappy with its policy that profiles must be attached to their given names, The Daily Dot reported Monday. The policy has proven particularly unpopular among members of the LGBTQ community, many of whom go by chosen names. "Facebook is a community where people use their real identities. We require everyone to provide their real names, so you always know who you're connecting with. This helps keep our community safe." Ello works differently. You don't have to use your real name, and there's a "zero tolerance policy" for harassment that means stalkers, trolls and accounts exhibiting other negative behaviours would be banned from the site for good, co-founder Paul Budnitz told The Daily Dot. Since that story, interest in the site has spiked, with as many as 4,000 new users signing up every hour, BetaBeat reported. People can only join Ello through invitation. Those who are already members can invite five people by sending them specific codes; aspiring users can also request invitations through the homepage. From there, you can add other users as "Friends," possibly people you know personally, or "Noise," in which you follow people in a manner similar to how you might on Twitter. You can post status updates with text, images and GIFs. To do this you have to drag images into a post from your desktop and scroll over the arrow underneath. There's room for the network to catch up when it comes to video. Unlike Facebook and Twitter, which shows the videos themselves, all you can do on Ello is post a link. But not everyone is impressed with the site. Artist "Creatrix Tiara" said in a Tumblr post that Ello is "way more unsafe than Facebook, Twitter or other social media outlets and CMSes." "Ello deliberately does not have any sort of personal privacy settings, and it does not have any sort of features to block or report individuals, nor any way to consent to being followed," she said. Tiara is less concerned about companies selling to her, saying that they don't "usually try to ruin my career, or spread personal rumours about me, or harass me about my race or gender or sexuality." But for now, it seems many other new users don't quite feel the same way.